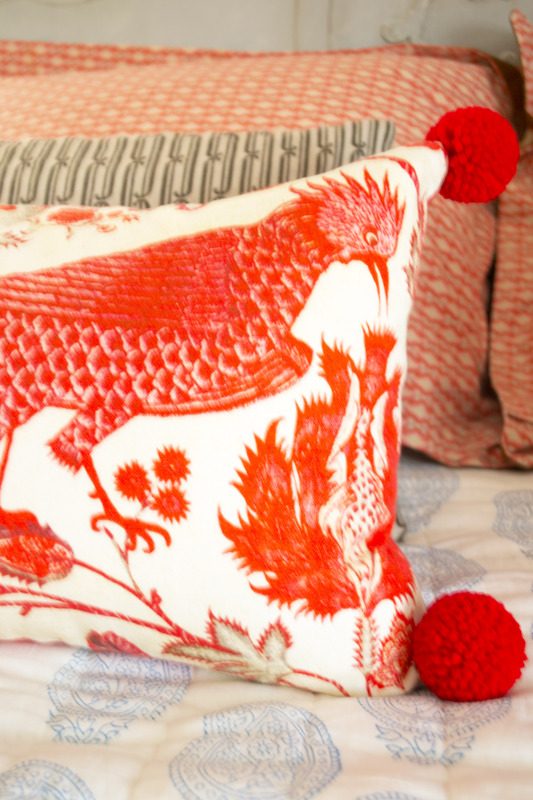 It’s not rocket science, but the magic of a good pom-pom (these red yarn balls were handmade by Wandering the West on etsy.com) can bring life back to old tired pillows and plain Jane curtains. A little pom trim can help elevate and soften the edges of a boxy studio short on architecture. 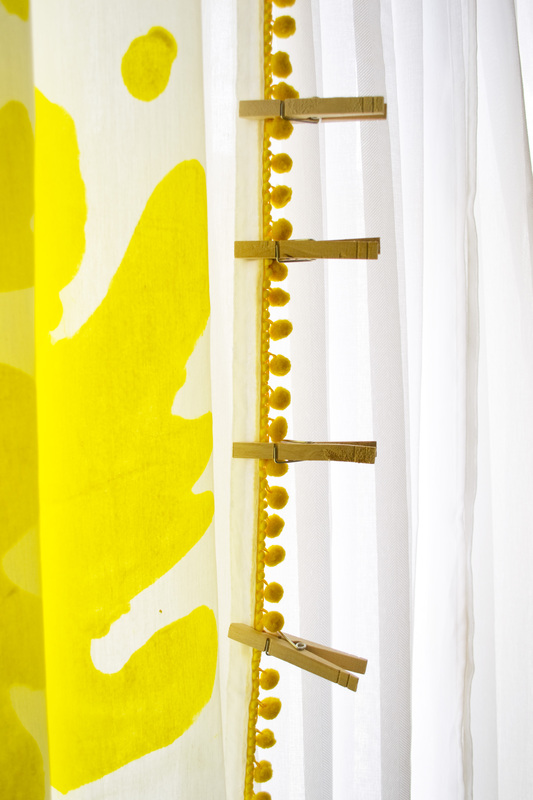 The easiest, no-sew way to add pom-pom trim to curtain panels is to glue it. Since I added the trim after the curtains were already hung (and felt lazy), I glued the trim onto the sides of each panel right on the spot, using clothespins to keep them in place as they dried. The local dollar store is the place to buy clothespins on the cheap. I used to be a little timid about revealing my true maximalist design tendencies, especially living in such compact quarters. But after reading Justina Blakeney’s delightful book, The New Bohemians: Cool and Collected Homes, I feel a new found freedom to fully embrace a “more is more, and less is a bore” decorating spirit. The book features one layered room after another, highlighted by global touches, with no apologies. Living in less than 800 square-feet forces you to edit, but layering in small touches like colorful pom-pom trim, can transform a petite abode into a cozy cocoon. Gloria Vanderbilt once wrote that “decorating is autobiography,” so I guess you could say I am in a bit of a beige mood. 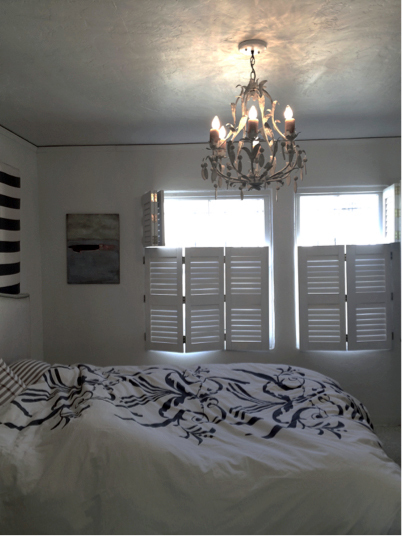 The master bedroom is the last room in my beach cottage to get any design attention and changing the flat contractor white walls was first on the to-do list. One of the biggest misconceptions about small space design is that white walls will make a bedroom appear more spacious, brighter, more relaxing and less cluttered. Here’s the challenge. It takes a tremendous amount of natural light, from dawn to dusk, to make white walls come alive and not appear dead and sterile. 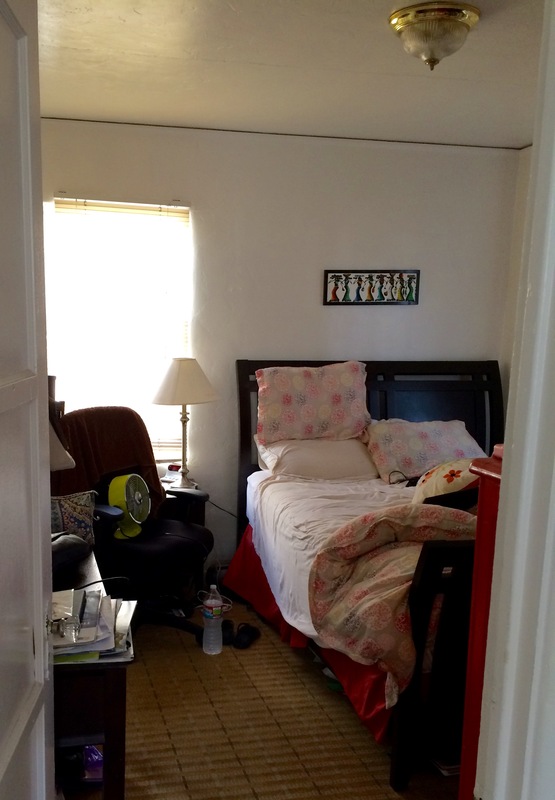 In this petite cottage, the master bedroom is located very close to the house next door and although it gets natural light throughout the day, it is filtered and shaded, making the plain white walls look muddied and somewhat dull. Painting a relaxing gray-taupe neutral (Sherwin-Williams Amazing Gray) on the walls will make the room feel and look expansive, instead of boxed in. I had Sherwin-WIlliams make the paint color 30% lighter (not whiter), which looks great in the day and at night under incandescent lights. 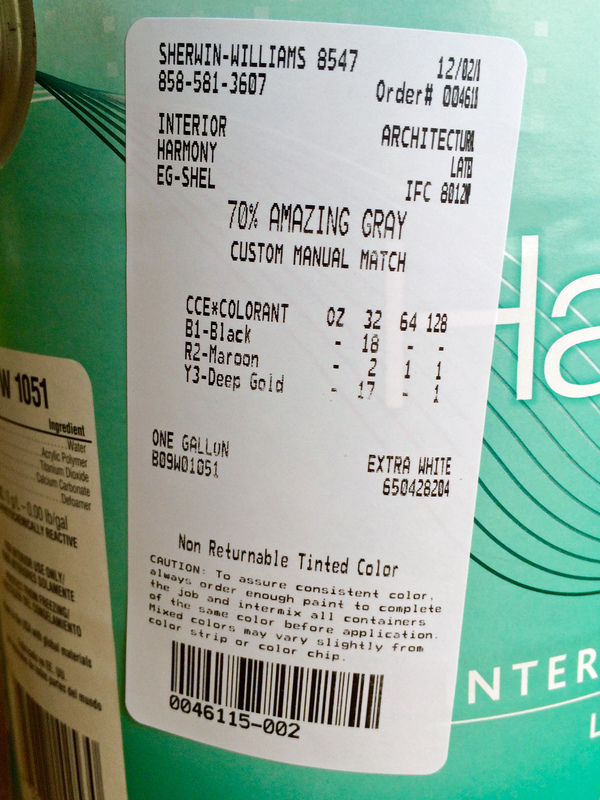 Here is the paint label in case you need it as reference. I will post photos as soon as I finish painting! I am a lover of bold colors and Amazing Gray will provide the ideal neutral backdrop for splashes of bright hues and patterns to come into play for an added dose of happy. Stay tuned! 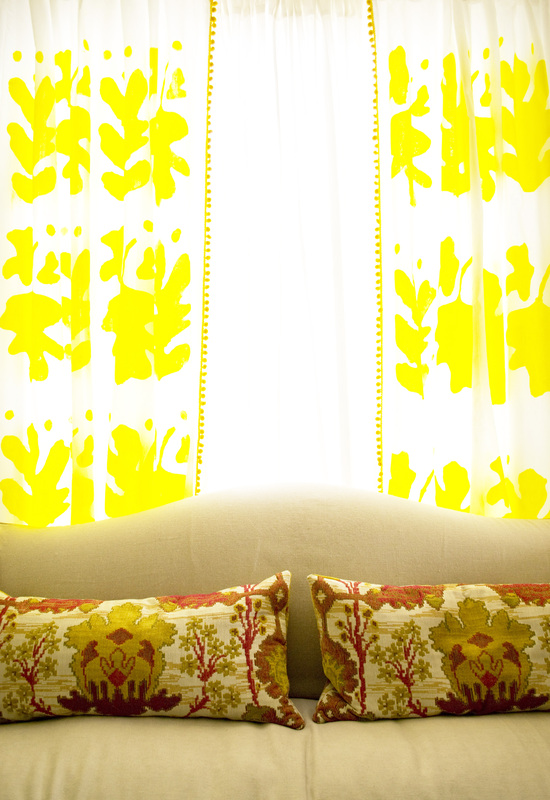 Over the years, in each of my nutshell-sized spaces, dressing up the windows was one of the easiest ways to add color, a style punch and a custom look to a generic shoebox. It can be easy on the budget if you make your own and the best part, you can take them with you. 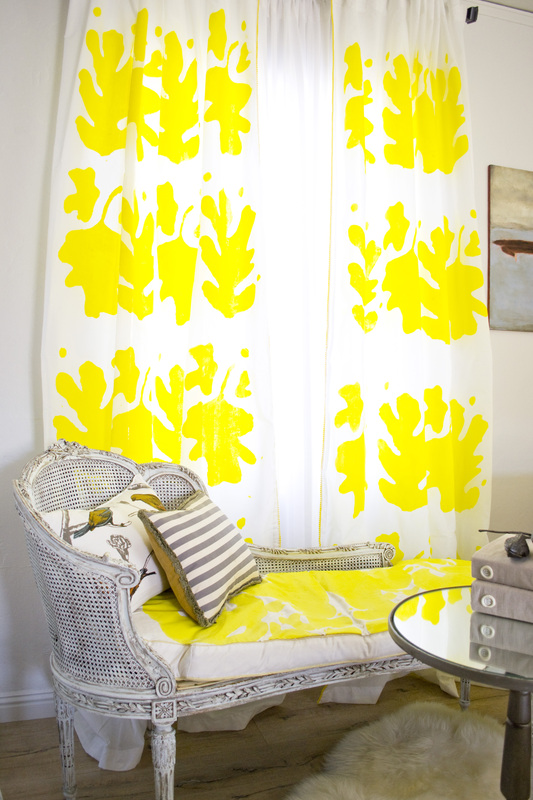 I change the look of my rooms often so I don’t like to invest too much money into window treatments. 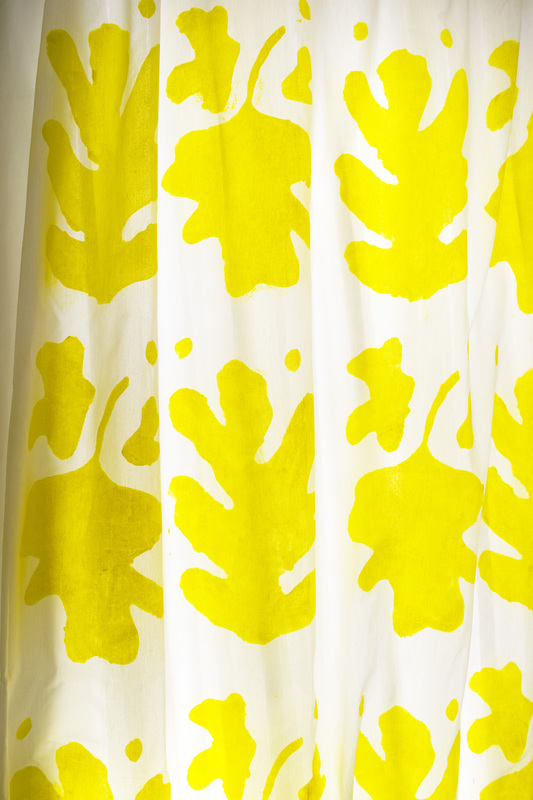 For the new drapes in the living room, I bought white Ikea Vivan curtain panels. They are sold in pairs for only $9.99. If you need panels that are longer than the standard 84″, Ikea is the place to shop. The Vivan panels measure 98 1/2″ long. 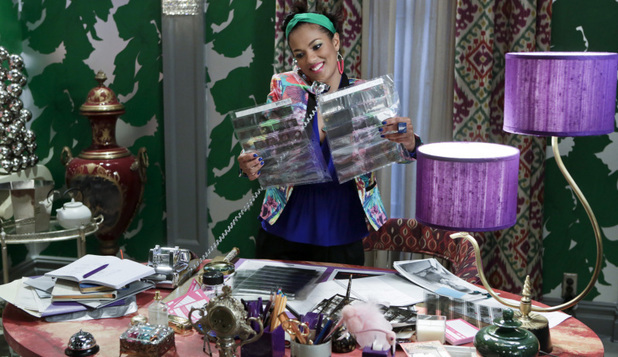 I knew I wanted a hand-painted pattern on the curtains and was inspired by Matisse’s paper cutouts and the set design of the now defunct Carrie Diaries. Just love that green wall covering! Making my own custom stencils was the way to get the look for less. 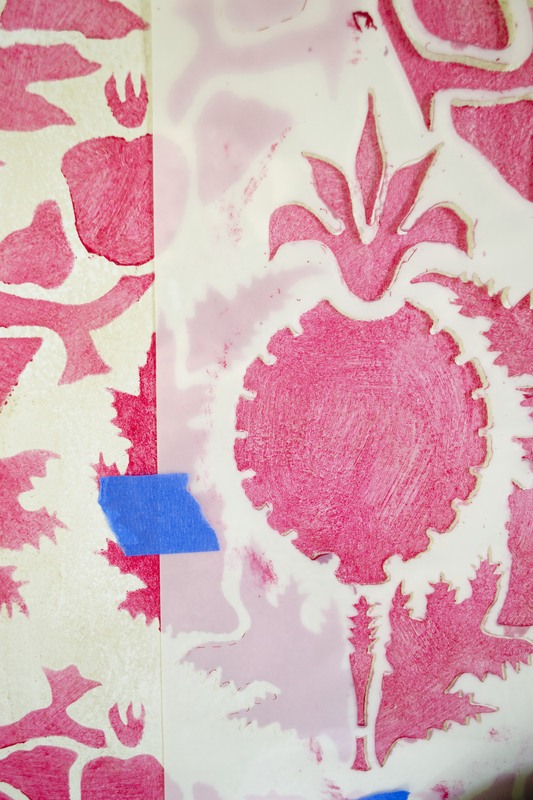 • Draw and cut out two stencils, sort of free-form leaves, from mylar available at craft stores. Alternate each leaf stencil in the overall design. • Buying fabric paint can get expensive and the available color palette is limiting. 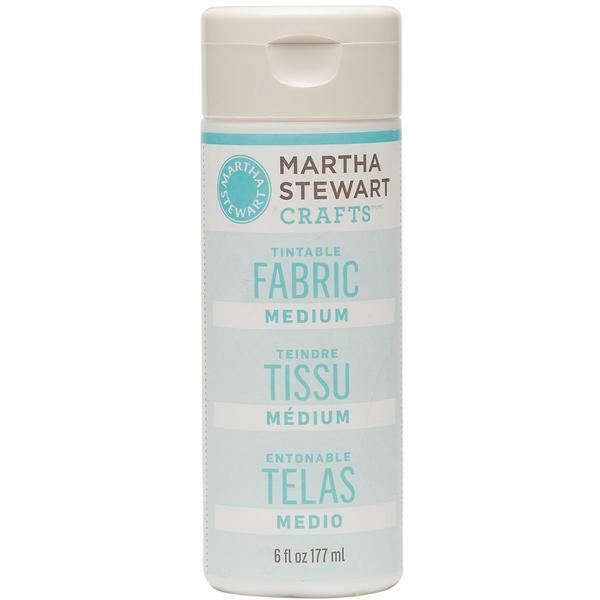 Instead, use Martha Stewart Tintable Fabric medium and mix it in with Martha Stewart Meyer Lemon acrylic paint color. Follow the directions and use 2 parts paint to 1 part paint medium. The medium will not change or dilute the color of the paint. Use a sponge brush for easy application. The paint should be runny and when it dries it will be soft and flexible. Let the paint dry for 24 hours and then on the reverse side, heat set with an iron on medium-high heat. When all is said and done, I have custom-painted drapes for about $10 per panel. Cheap, cheerful… and oh, so chic! 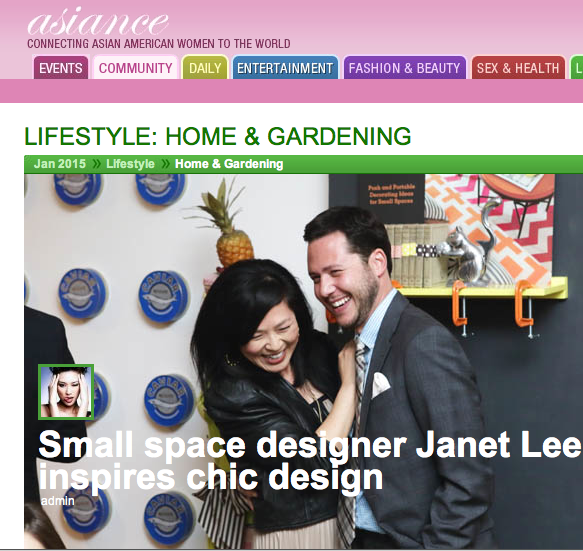 Asiance Magazine features Asian-American women doing cool, innovative things in the world of art, health, business and entertainment. They were kind enough to post a one-on-one interview featuring me and the budding Living in a Nutshell brand. Editor, Jaymie Moran, helped me make the connection between growing up in a large, boisterous Korean household (six kids), never having a room of my own, which fueled my passion for small-space design. Thanks so much Jaymie! 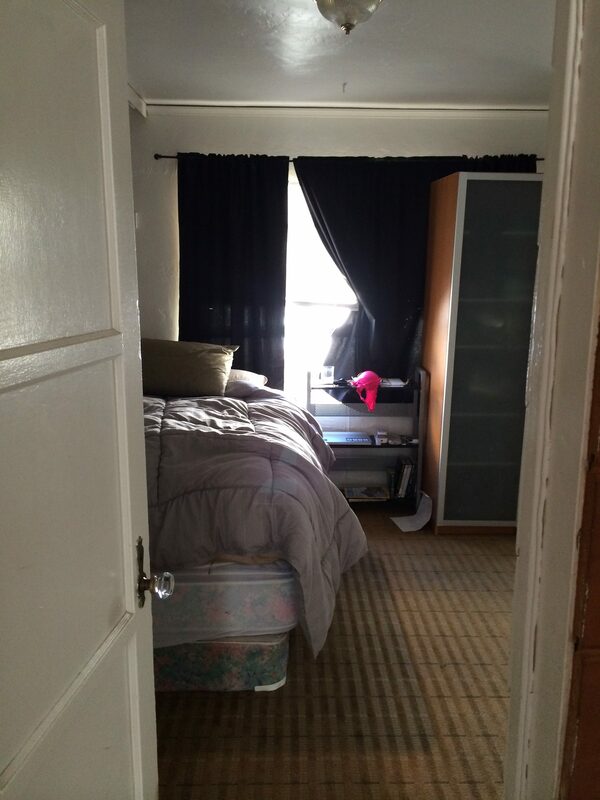 My petite guest room was a standard contractor’s white, featureless box, clocking in at about 136-square feet. 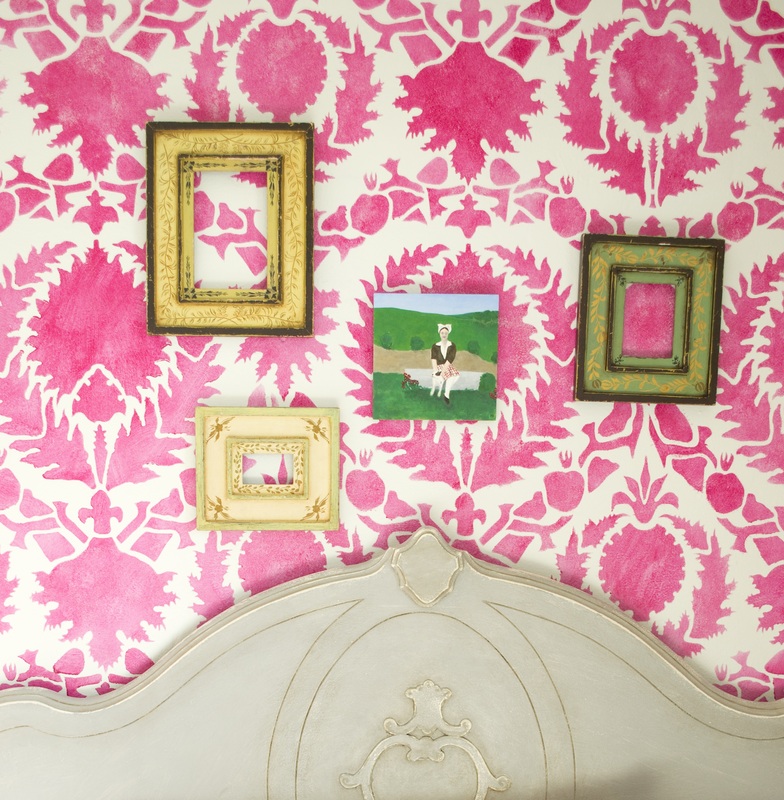 I decided to go with a bold pink patterned wall to make up for the lack of architectural detail and charm in the space. 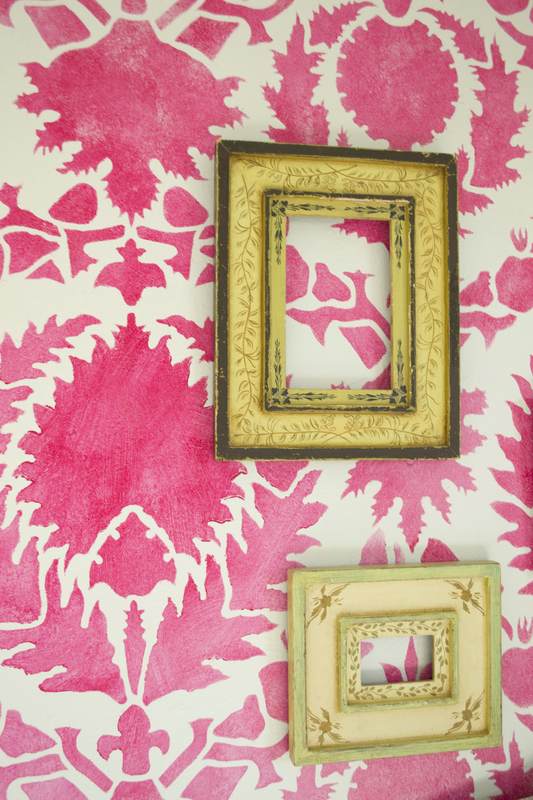 I don’t have a lot of pink in my wardrobe, but I always feel energized using this bold color in interior spaces. 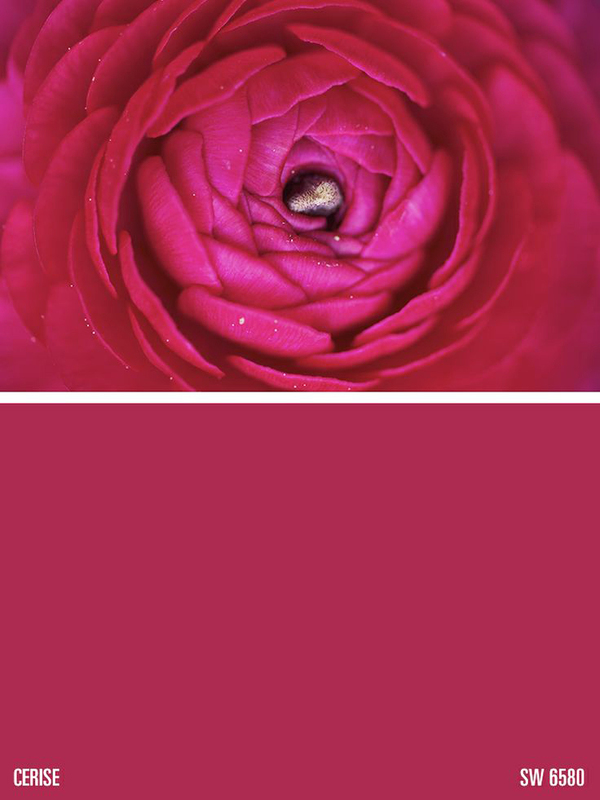 I went with a deep, red based pink called Cerise (which means “cherry” in French) from Sherwin-Williams. Because you use a dry brush technique with stenciling, you can control the amount of color saturation to fit your taste. I wanted the overall look to appear timeworn and faded on the edges so I tended to paint with a lighter touch. This modern Suzani-inspired stencil from Royal Designs is like art and architecture on the walls and helps to make this room feel grander. If you are painting a large space, I like to buy two stencils so one is always wiped down and clean while the other one is in use. Then alternate stencils once the paint builds up on the edges. A little paint goes a long way. 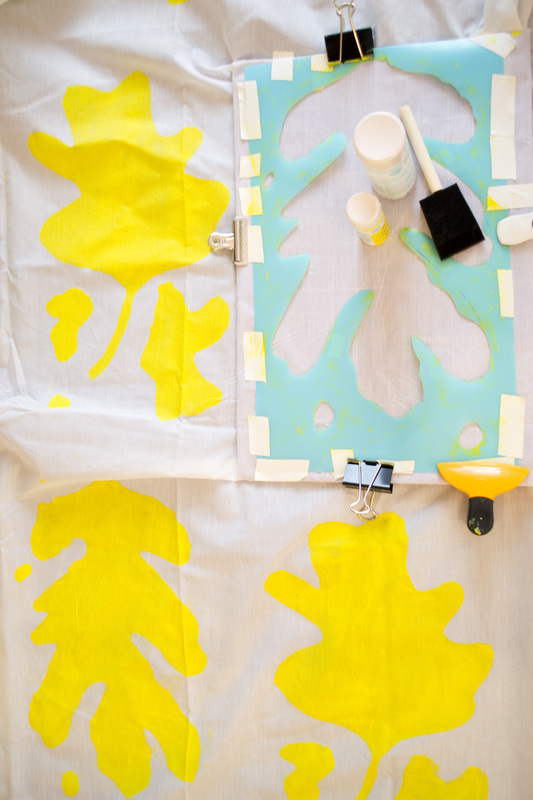 For a small bedroom, you can stencil the walls using a paint sample-sized can for only $7. Sherwin-Williams paint samples cover 75-square feet with regular wall overage and with a dry brush stencil effect, you end up using very little paint. 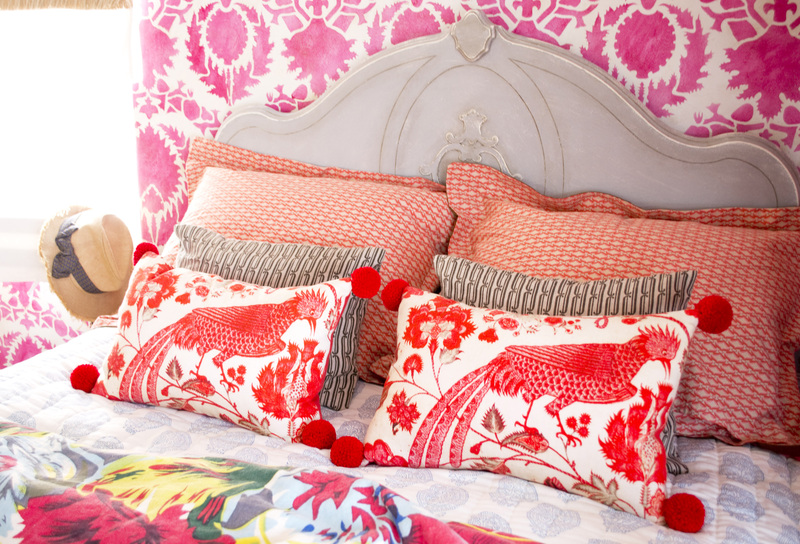 The fresh paint color and wall pattern have inspired a whole new approach to bed linens and duvet covers. I am thinking it’s going to be boho chic with a mixture of feminine and masculine colored pillows and linens. Stay tuned for the unveiling. It was time to purge some of the custom pillows I made from my collection. My sister and I organized a sample sale of inkjet and fabric transfer pillows made from silk and linen. I realized how much I rely on fabric transfer paper as my personal atelier. One way to keep your petite pad from looking like a cookie-cutter shoe box is to add custom pillows to the space. Fabric transfer images look extra chic printed onto textured shantung silk. The transferred images reveal the nubbiness of the shantung, appearing a bit distressed and faded. To soften the stiff texture of a photo image on cotton or silk, try draping silk chiffon over the image for a nice effect as you can see in the pillow below. Use Avery T-Shirt Transfer Paper for inkjet printers because it is available everywhere. Once you tackle the basics of fabric transfer, you’ll discover lots of ways to add a custom stamp on an entire range of accessories and art. 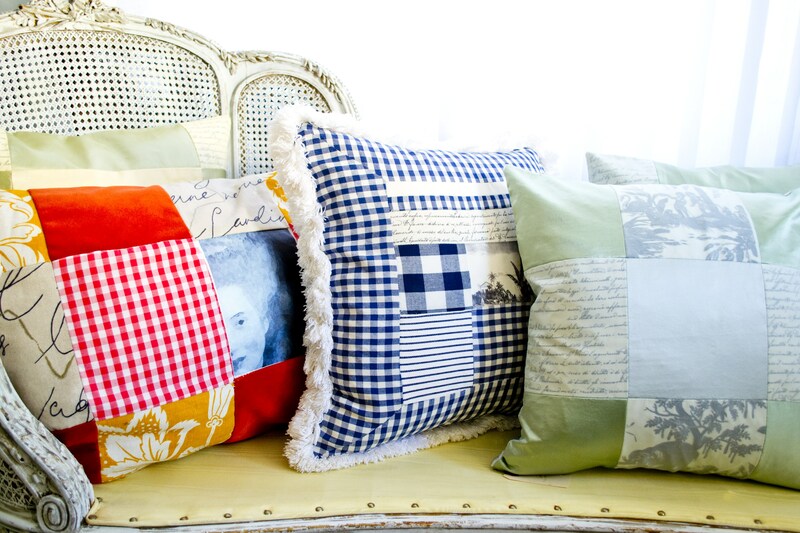 It is sad to see these pillows go but hopefully they will help make someone else’s space feel like a home. In my never ending quest for stylish storage that won’t make a space look like a storage warehouse, I once again turned to Ikea for the solution. 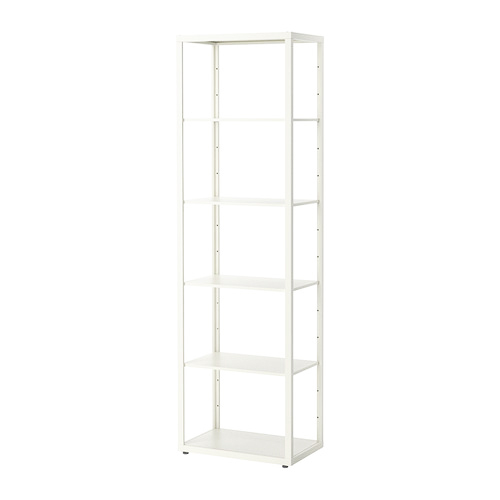 The Fjalkinge metal bookshelf is sturdier than the MDF particle board options and was only $100, which fit the budget. More importantly, the bookshelf was skinny enough to fit into a tight corner. In small spaces, look for bookcases with an open back design, which feels less cramped and closed in. I was looking for a little more pizzazz than a plain white bookcase for the guest bedroom. I decided to spray paint the metal frame a brassy gold to add a little shine into the space, while being neutral enough to match everything in the room. The shelves were left white and the edges were lined with gold washi tape. Make sure and choose a paint and primer in one to keep paint from scraping off easily. The gold metal frame reminded me of display shelving you see in a chic boutique. 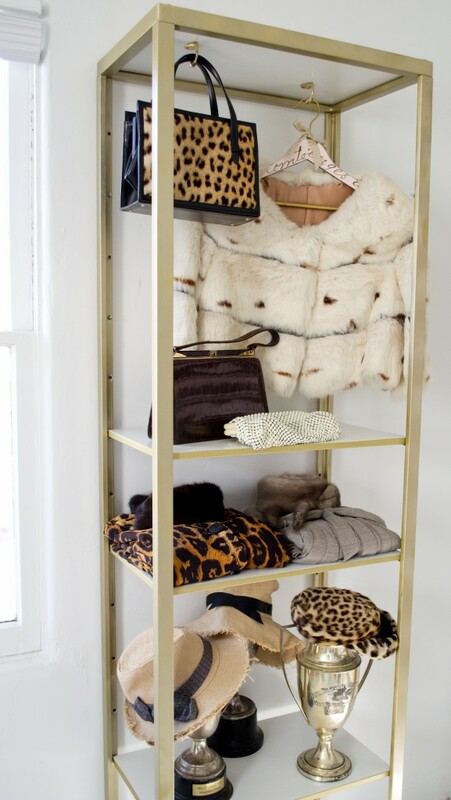 Attach gold coat hooks from the “roof” of the top shelf to feature favorite pieces from your wardrobe. In my case, that meant displaying my vintage collection of handbags, hats and furs my mother passed down to me. 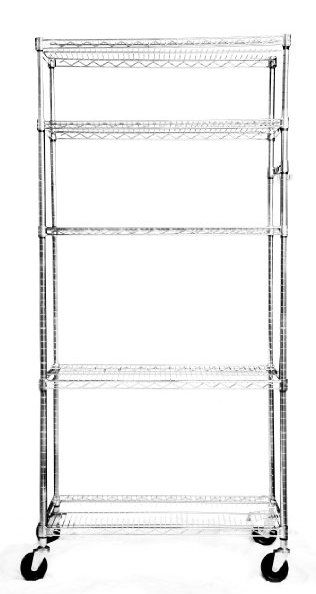 The shelves are metal so you won’t need to use anchors to keep screws from weakening and falling through. 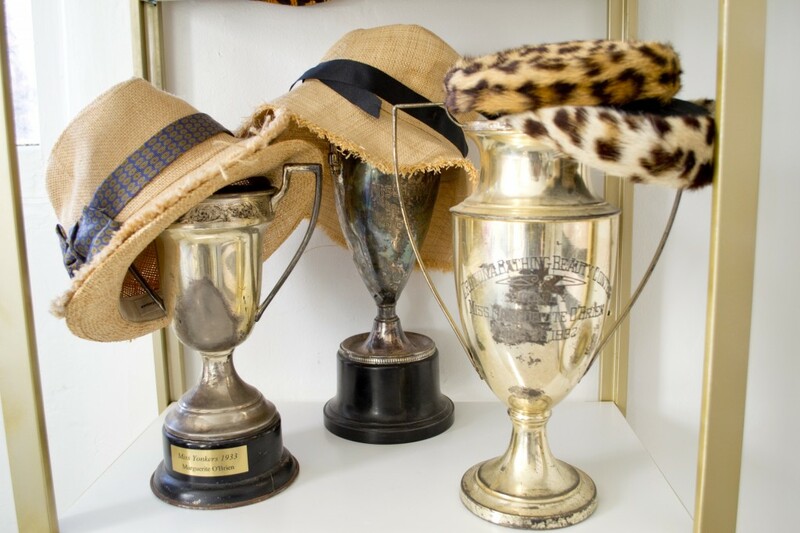 Vintage beauty pageant trophy cups have become perfect hat display stands. Now, the guest room is taking shape. Time to paint the walls! I have an aversion to plain white walls. Color makes me the happiest. Stay tuned! To me burlap is the working woman’s linen. 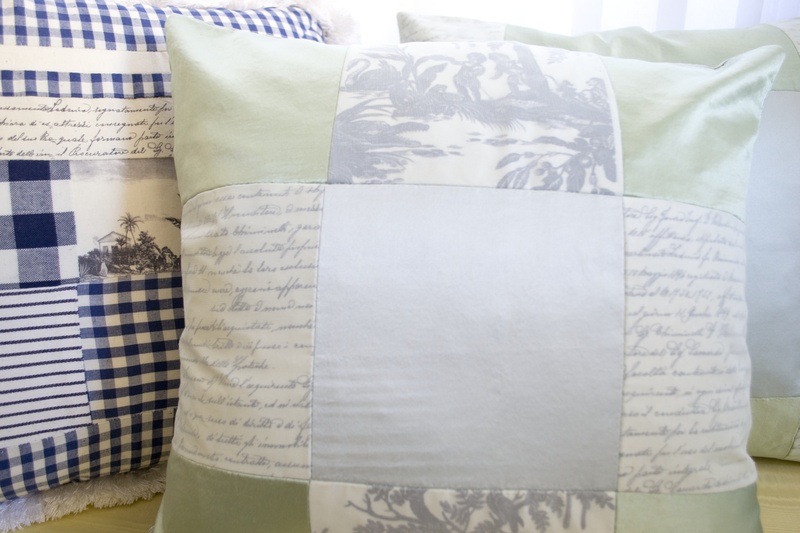 With its friendly price tag of $3 (or less) per yard, you can add a touch of French, rustic charm to any petite space without breaking the bank. When I relocated my wire-shelving tower* from the kitchen to the guest bedroom/craft room, I stocked it to the brim with messy art supplies. The open-shelving started to look like clutter. To keep the bins undercover when not in use, I sewed a burlap cover that incorporated salvaged fabric left over from past projects. 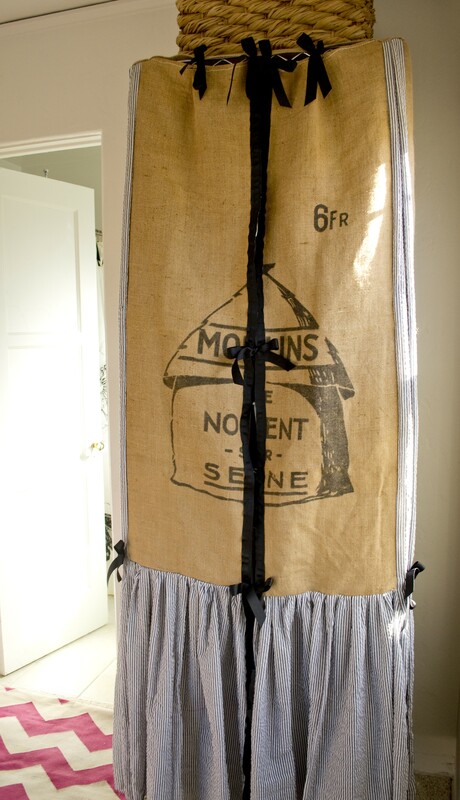 A vintage French grain sack from ebay, became the front feature of this pantry shelving cover. Black and white-striped seersucker fabric and a few yards of burlap for the back and sides filled in the gaps and pulled the cover all together. 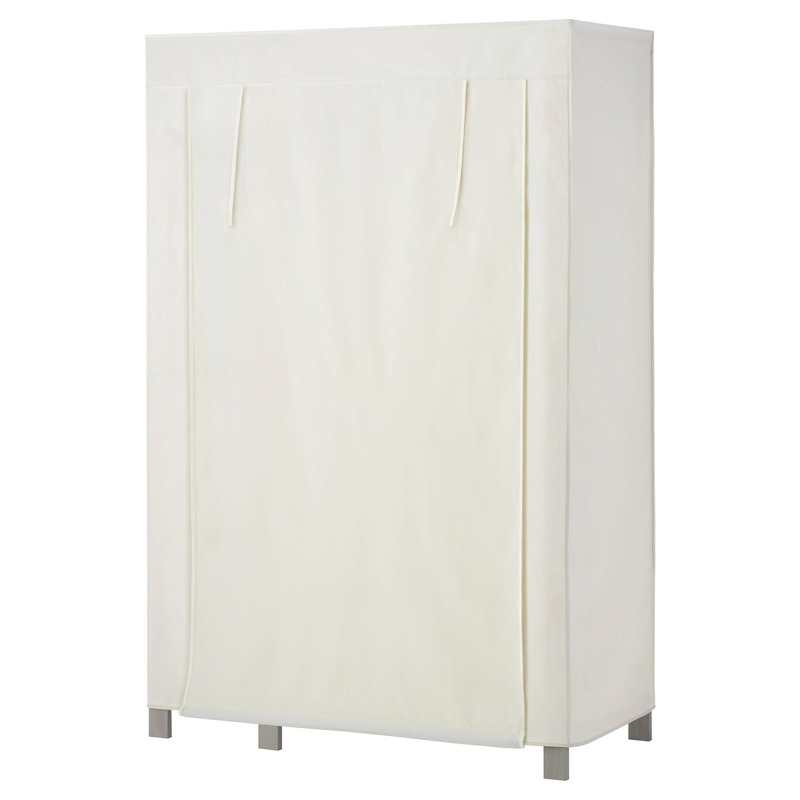 If sewing is not your thing, look for pre-fab canvas garment rack covers like this one from Target and embellish it with fabric paint or trim to boost your decor. To custom fit the cover to the size of your rack, you can fold, pin or clamp excess fabric along the seams from the inside. Give it a whirl! 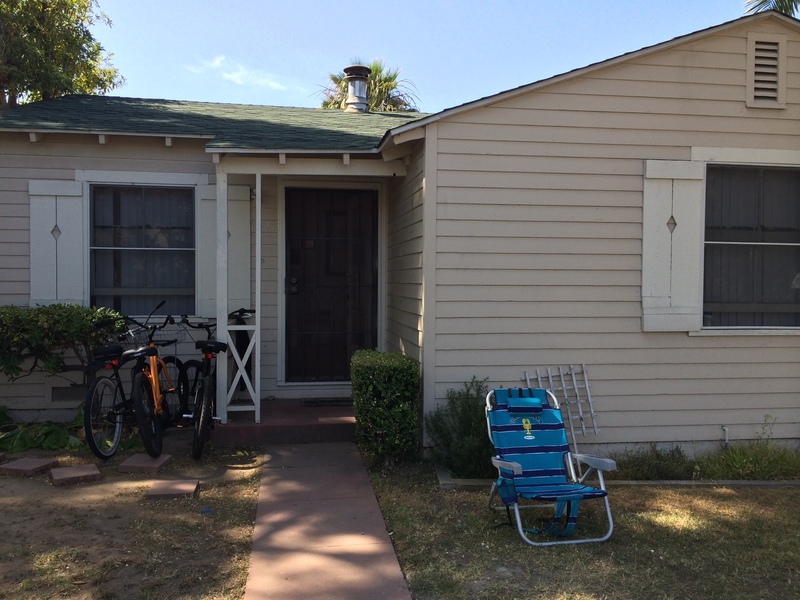 I have been blessed with a two-bedroom, 1940s cottage (a whopping 614-square feet), about four blocks from the beach. For the past two decades, this former rental property became rundown over the years from careless tenants and neglectful gardeners. 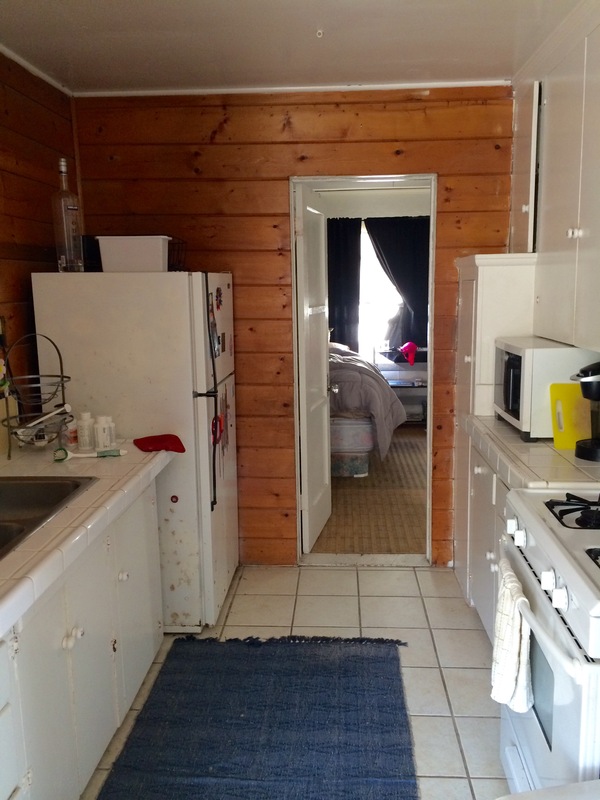 you could see that this cottage has good bones and real design potential. 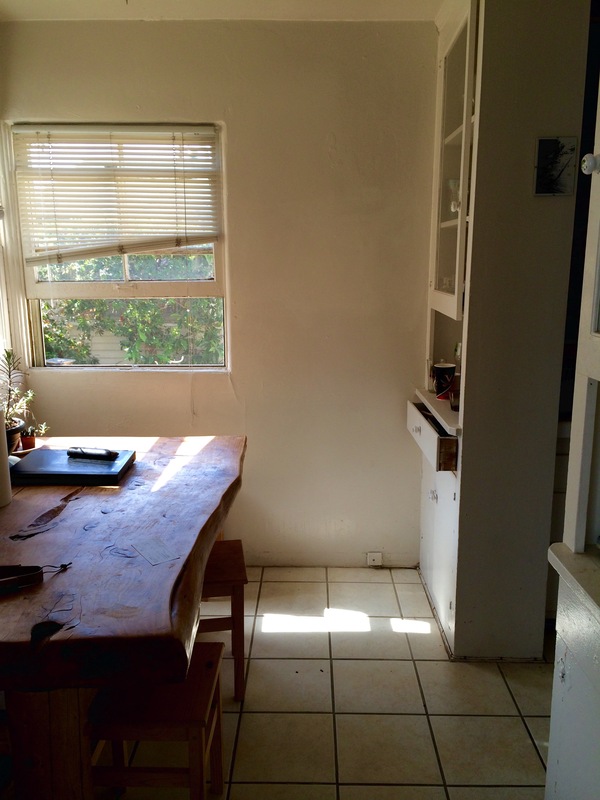 Every room, including the petite garden in front, is going to be my personal design lab. In the next few months, I’ll share my twist on chic, smart, portable decor ideas, storage solutions and garden design tips on a budget without sacrificing style. I move into the house in a few weeks so I am painting the shutters Benjamin Moore Essex Green. It is a classic green-black. I can hardly wait for a tiny bit more curb appeal. 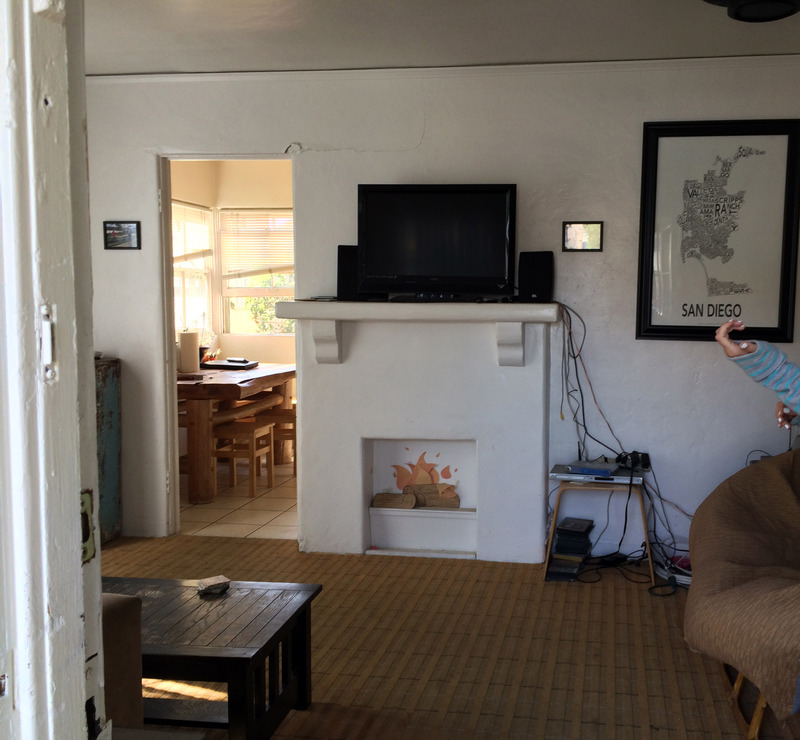 Check back and see how the little shack becomes a cozy beach cottage, room by room! 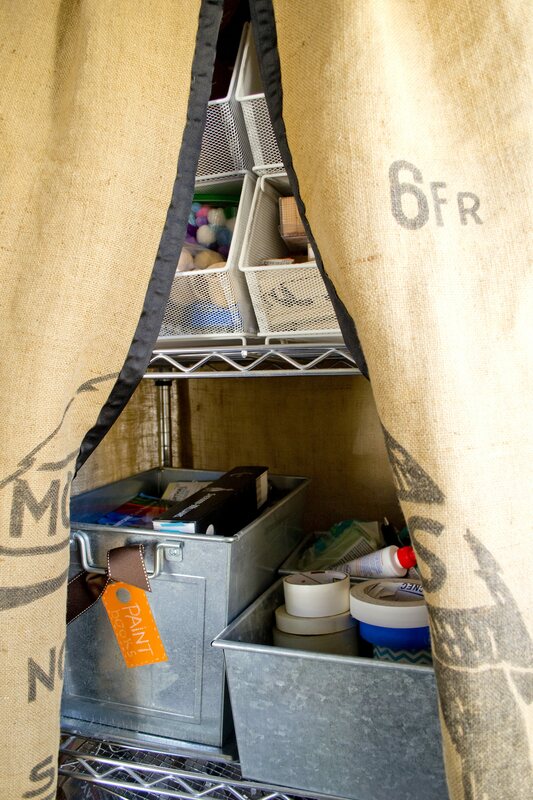 Tired of jockeying for storage space in an already jam-packed closet? Serial small-space nesters (like me) stash away a few extra guest chairs in their petite abode. But with very little storage space under the bed or in closets, what’s a girl who likes to entertain to do? 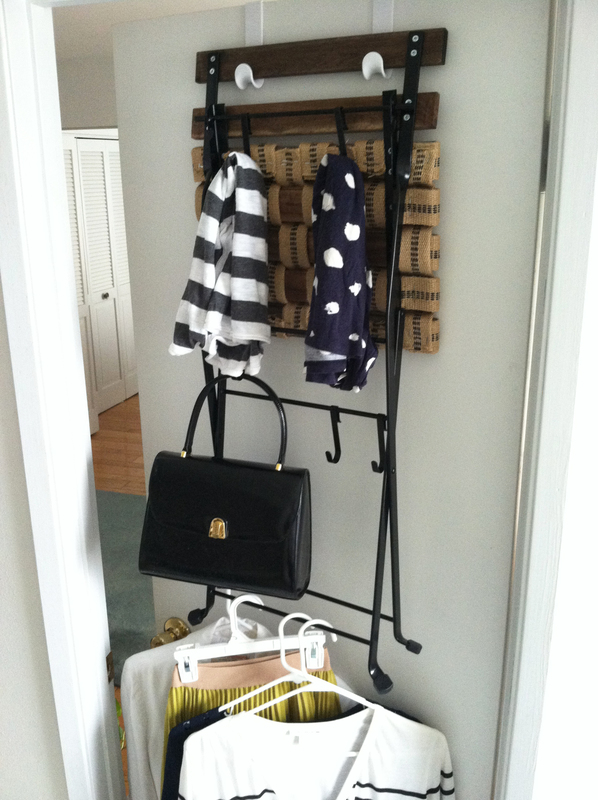 When not in use, hang a folding chair with the seat either open or closed onto over-the-door closet hooks (removable, of course) to double as a clothing rack. Add a few utility s-hooks or snap-on hooks to the stretcher bars of the chair for an added storage layer. 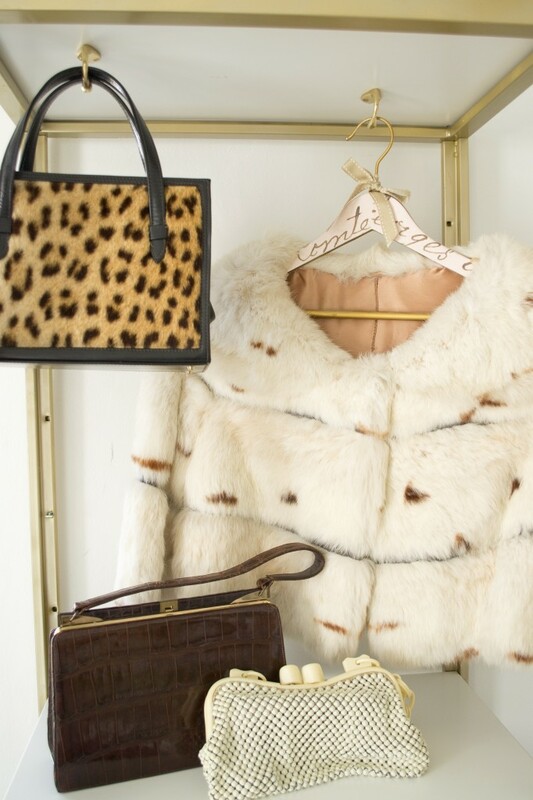 Hang purses, scarves and hats on the hooks so you can see everything you have. 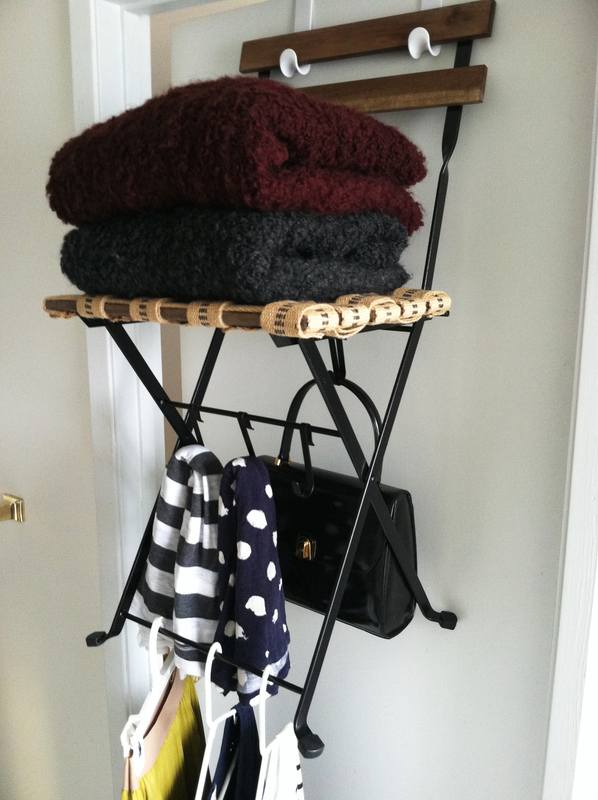 There is also a seat-shelf to keep bulky folded sweaters and sweatshirts neatly stacked. If duty calls, chairs are ready to hit the floor and work the room at a moment’s notice!